Situated somewhere in the middle of my three-week, million-calorie binge in New York last year was kajitsu, a meditative pause in an otherwise reckless episode of indulgence. 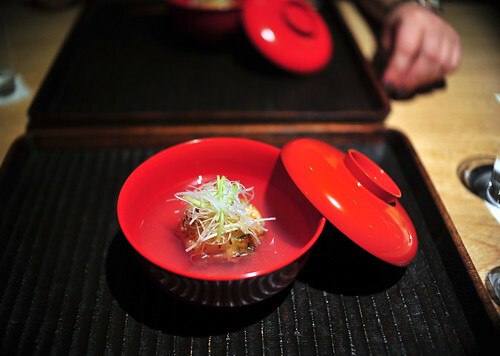 Tucked below street level in the East Village, kajitsu is quiet and clean, not unlike the food it serves, a series of vignettes in kaiseki form. Here, chef Masato Nishihara adheres to ahimsa, the dietary devotion of Zen Buddhists, and defies the current, meat-macho mindset with a vegan – yes, vegan, not vegetarian – menu. And, apparently, he does so with such deft and consistency that he has become favored among some of America’s best chefs, and Michelin has deemed his food worthy of two stars. Grated cucumber, celery, dark night carrot, pearl onion, glass noodles. Grated Fuji apple and onion, purple potato. Warm dipping sauce, herbs, and wasabi. Grilled Nama-Fu with Soy Morel Mushroom Sauce; Grilled Garbanzo Beans. Diced sunchokes and fennel puree; house-made pickles. To see a slideshow of all of the photos from this meal, CLICK HERE. Can there be joy in asceticism? Is there reward, beyond the religious or spiritual, in abstaining or denying oneself worldly pleasure? Is meat a worldly pleasure? And is a meal without meat an act of asceticism? Each of us brings a different perspective and set of expectations to the dinner table, and I couldn’t help but evaluate mine at kajitsu. We ate high and low, and all around, with great variety. So, even though my family is not Buddhist, the vegan foods of Zen Buddhists were not foreign to me as a child. In addition to meat, we ate spongey mian jing (wheat gluten), cooked with lily stalks, black mushrooms, wood ear mushrooms, and peanuts (kao fu, one of my favorite Chinese dishes); and what we call in Chinese “vegan chicken” and “vegan duck” (in English, it is called “mock” chicken/duck, a telling difference in cultural perspective). And it was not uncommon for bamboo shoots, black mushrooms, and tofu to be the star ingredient of a meal at home. So, my approach to eating has always been rather open. There are few rules at my table, and fewer expectations. 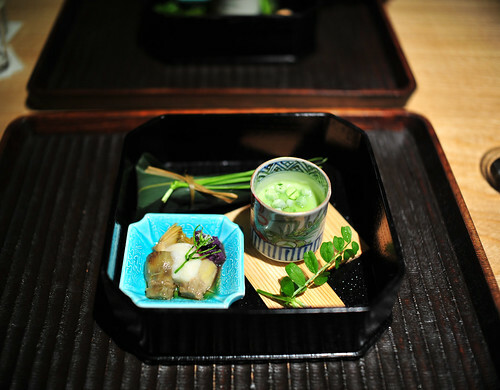 For me, veganism was less the elephant in the room at kajitsu, and more of a detail. When sitting down to eat, I can only hope that what alights is well-prepared and tastes good. And at kajitsu, it was both, and more. Arriving in Japan from China over a millennium ago, shojin cuisine, like all aspects of Japanese cooking, has been refined into an art form. And, like almost any other subset of Japanese cuisine, it is slowly bleeding into the mainstream. Nishihara was not trained in shojin cookery, and he freely admits that his version of shojin is not entirely traditional. However, he remains faithful to its artistry and focuses on the ingredient quality, staying seasonal. Our meal reflected this. Everything was beautifully presented in dioramas of the season, vegetables were pristine and fresh, and the cooking was precise and flawless. 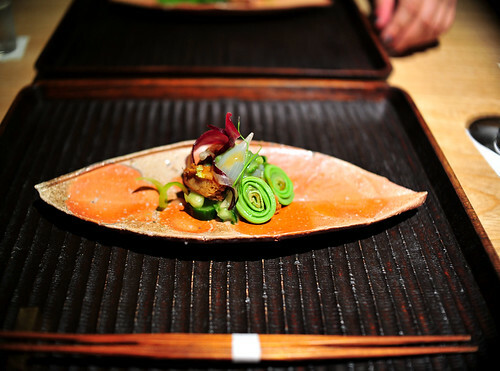 Straddling spring and summer, we had tender fiddleheads, served with spongey rikyu fu (pure gluten), baby root vegetables, and a light cucumber salad, flecked with jellied strands of glass noodles. There was chilled pea soup, topped with frozen spring peas, and young artichoke hearts topped with a frothy purée of onions. 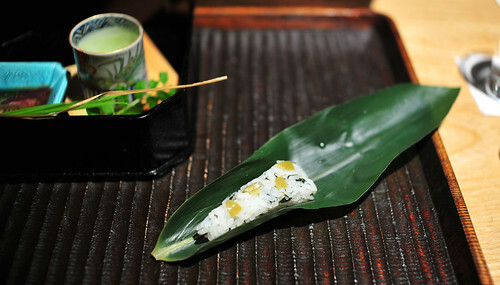 And there was a fat log of white asparagus, tempura-fried, with a shiso leaf wrapped around its base, a refreshing surprise at the end of the stalk. Courses alternated between hot and cold, a therapeutic succession of temperature changes to comfort and refresh. Even within a course, there might be a spectrum, or juxtaposition of temperatures, like our fourth one, a plate of cold soba noodles accompanied by a warm, dipping broth. Nishinara did train in a soba restaurant in Japan. His soba is very good. And, in accordance with Asian sensibilities, this meal presented a mosaic of textures. Rice was not only perfectly cooked – pearly and tender – but in one instance, flecked with crunchy bits of pickled green gage plums, and in another, topped with a fried chrysanthemum leaf, flaky and crisp, and meaty dices of sunchoke. Our fifth course – the one with the tempura white asparagus – coupled grilled garbanzo beans, still chalky and green in their pods, with namu-fu, a soft, almost gelatinous gluten product, glazed with a rich morel sauce. And for dessert, there was mochi, that mastic, sweet rice confection that, here, was used as wrapper for a “raviolo” with a surprisingly sweet, red bean paste filling. My favorite course of the night was our second one, a warm, vegetable broth that was so intensely xian, that it was hard to believe it wasn’t shellfish stock. In it sat a meteor comprised of grilled cabbage, tofu, and vegetables, magically held together by a gossamer, fried shell that seemed unaffected by the liquid around it. The outside stayed crisp and light, and the ingredients inside, tender and warm. It was immensely satisfying. And, surprisingly, I really enjoyed our last course, a bowl of hot matcha, roasty and toasty, served with hard candies and sweet rice wafers. The contrast of bitter, hot tea against the sweet crunch of the candies and wafers was simple and lean. Maybe there is joy in asceticism. If there is rhythm to a meal, then the one I had at kajitsu was a series of pauses. In a world where dining is theatre, and where diners often demand a faster plot, a livelier story, kajitsu offers a refuge, a time-out, an intermission. Quiet yourself and consider each bite, Nishihara’s cooking demands. Here, every course is a vignette, every vignette a conversation. If you move too quickly, you’ll miss it entirely. Set aside your expectations, or reevaluate them at kajitsu, and you may leave, as I did, refreshed, reset, and reflective. ~ by ulterior epicure on January 15, 2012. So glad you did this post. I was at Kajitsu a few months ago and loved it. We had a similar dish as your second course, except with maitake mushrooms. We raved about the broth but didn’t know how to describe the taste. I think the soup was a perfect example of xian. Great post UE. I agree wholeheartedly. Our autumn menu was also delicious, beautiful and pleasantly quiet & subtle. I wrote a short review of the meal here, in case you are interested. curious to know if you are concerned about current radiation in Japanese food as several people have told me they have sworn off it even though it was once their favorite. I ate at Kajisu during Starchef last year. That meal brought a tear in my eyes. It reminded me of the time I spent with my dad in Japan. Considering the price they charge, it is a steal. I am going back there again this year.